Biarritz – home to the second oldest golf course in Europe – is a wonderful base for a golfing holiday. It offers a pleasant, relaxed seaside feel, combined with a sophistication worthy of south-west France’s premier holiday resort. Located on the coast 30km from the Spanish border, Biarritz is a heady mix of Basque and beach cultures. Temperatures here are ideal for golf, with daytime averages of between 20°C (68°F) and 24°C (75°F) in the summer months, with nice coastal sea breezes taking the edge off the hotter temperatures found inland. With its own airport close to the city centre, Biarritz is just a few hours from anywhere in Europe. Plus it’s just a morning’s drive from Bordeaux – that means you can combine some of France’s best links courses around Biarritz with the famous vineyards of Bordeaux further north. And there’s plenty to do away from the course, too – for you and for your non-golfing friends and family! Whether you’re looking to combine your French golf holiday with a spot of sun and surf, or whether you’ve got family or friends in tow who need entertaining while you’re on the course, there’s enough in Biarritz to keep everyone in the holiday mood. Take a look at a sample holiday package here. 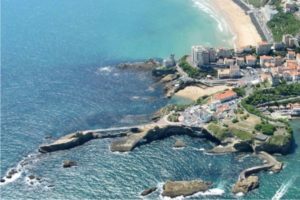 Biarritz Ocean combines the city’s aquarium and the Cité de l’Océan in a bid to introduce visitors to the ocean and raise public awareness about the fragility of its ecosystem. The aquarium is home to thousands of species from the underwater world. Set out across almost 50 individual aquariums, including a seals’ basin and a sharks’ cave. The aquarium specialises in sea life from around the Bay of Biscay, and follows the underwater journey from along the Gulf Stream to the Caribbean Sea and the Pacific. For young sea adventurers there’s seal feeding every day at 10.30am and 5pm. We can’t think of many people who wouldn’t want to drop in here. A treat for both young and old, the Planète Musée du Chocolat combines the Basque country history with a journey through the history of chocolate – a perfect combination. The museum is a mix of – yes! – chocolate tastings, multimedia displays, and historical chocolate-related memorabilia. There’s even a homemade hot chocolate drink to enjoy at the end of your visit. For children, there’s chocolate painting (what could be more fun?) and lollipop-making workshops, while big kids get to combine wine-tasting with chocolate-eating. The Biarritz lighthouse was built in 1834 and stands 73 metres above sea level overlooking Cape Hainsart. Aside from guiding ships in from sea, the lighthouse’s other role is to mark the boundary between the Landes coast and the Basque Country. The lighthouse is open to the public, though you have to climb 248 steps to reach the top. But once there, you’re rewarded with wonderful panoramic views of Biarritz and across to the Basque hinterland. This is one of Biarritz’s hidden gems. Home to thousands of pieces dating from prehistoric times to the 21st century, the Musée Asiatica is one of Europe’s top 5 museums for Asian art. The collection covers works from across India, China, Tibet and Nepal, making it a must-see for anyone with an interest in the art, culture or history of the Asian continent. There are good surf beaches all along the western coast of France, but you simply can’t beat the stretches of sand in the south-west pocket. Here, it’s possible to grab late season sun and surf well the autumn and in the early days of spring. Some of the best beaches are to be found in the Landes region, which surrounds Biarritz itself. This area is well developed in terms of surfing infrastructure, with quality surf shops and surf schools. It’s very easy to find board rental or to sign up for a lesson to make the most of your time here. The vast majority of the breaks are beach breaks, which in the correct conditions provide beautiful hollow waves. They aren’t for the faint-hearted, though, and can be difficult to penetrate on the way out – their power should not be underestimated. A mark of their quality is the fact that a leg of the World Championship of Surfing arrives in Hossegor every autumn. Some of the most famous beaches in this area are just north of Biarritz around Hossegor, Seignosse and Cap Breton, Les Culs Nuls and La Graviere, although Biarritz also has a number of good beaches within walking distance of the city centre and ideal for families. Le Grande Plage: This is the main beach where many people head for a few quick rays or a post-work waves. It runs from the famous casino to the Hotel du Palais, where we often stay with our guests. Plage Port Vieux: The Port Beach is south of the Grande Plage. It’s right next to the ‘Port Vieux’ or Old Port. It’s a small beach in a rocky cove, which means it’s well sheltered from larger waves and the wind. Surfers will do better to go elsewhere, but it’s ideal for families, especially those with younger children. Plage Port Vieux is also home to local diving and swimming clubs, while there is a nice selection of restaurants and cafes within walking distance. Plage Côte des Basques: Just south of the Port Vieux is the Côte des Basques beach. If you want the authentic Biarritz surfing beach experience then this is probably the beach for you. It’s a long open beach that’s a big drawcard for surfers. This is THE city beach to come to if you have your board or if you want to hire one. It’s also a place of pilgrimage, as it’s here that surfing in France started. It really is a special surf spot. Its backdrop of cliffs – shadowed by the Pyrénées in the distance – make it a magical place to surf, with Atlantic breaks rolling in one after the other. If you’re not surfing, there are long, sandy stretches of sand, ideal for walking, building sandcastles, or simply relaxing with a book. Plage Marbella: Marbella is a lovely beach that joins the Côte des Basques. It’s a little wilder and feels a bit more isolated than its more famous neighbour. Less crowded, it is popular among local surfers. There is also a café/restaurant. Plage la Milady: Less crowded than the more famous beaches above, Plage le Milady is popular with locals, partly because there’s plenty of free car parking nearby. It’s also family friendly, with a nice beach walk, a children’s play area, and a café. For surfers, the breakers can be a bit lively when the tide is in. This Biarritz institution has been making espadrilles – traditional Pyrenean casual shoes that are a type of fabric-based, closed in sandal – since 1935. An ideal souvenir, they are perfect for the beach or for strolling along the ocean front. Drop in and say hi to Vincent Corbun, who is continuing this very traditional craft established by his grandfather in 1935. Cycling along the coast: Biarritz is located on the splendid EuroVelo 1 bike path that links Norway to Portugal. The French stretch is called La Vélodyssée, and around Biarritz it features beach-side paths and forest trails. We can arrange a day’s bike hire for you as part of a bespoke package so that you can explore at your own place. Train ride: What seaside visit would be complete without a leisurely ride around the city aboard Le Petite Train de Biarritz? The ride lasts 30 minutes, making it suitable for children of all ages. You can board at the Grand Plage or the Virgin Rock. Biarritz has a wonderful and growing selection of restaurants showcasing traditional French cuisine alongside Basque menus and international cuisine. The cuisine is heavily influenced by the sea, but also has hearty influences from the Basque hinterland. Fresh produce combines with innovative cooking to create unique menus from a unique region. Here’s a selection of Biarritz’s finest places to dine – we can make reservations at any of these restaurants as part of your golf holiday in Biarritz. Le Clos Basque – 12 rue Louis-Barthou, 64200 Biarritz. An affordable Michelin-bib restaurant offering classic, skilful cooking. Specialises in local cuisine. Combines fine, modern Michelin-star dining with breath-taking views. With one Michelin star to its name, L’Impertinent plays to its strengths, concentrating on delicious fruits from the sea. Modern cuisine from in a chef boasting one Michelin star. Another fine eatery concentrating on local seafood cooked well and presented nicely. At Greens & Grapes we can design a golfing package to introduce you to the fairways of Gold de Chiberta, just outside the Biarritz city centre, and Golf de Hossegor, the surfing hotspot to the north. 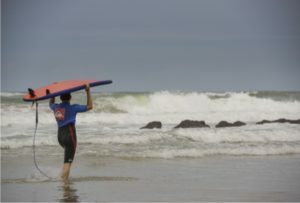 For surfers, we offer a surf and turf package so you can get the best out of the courses as well as the waves. Biarritz has a great selection of hotels for all budgets and group sizes. We love the Hotel du Palais, a charming hotel in the city centre that showcases the glamour of Biarritz alongside its history and romance. For families, groups or guests looking for a little more independence, we can also reserve a Pierre & Vacances hotel studio or apartment for you. We can put together the perfect golf break in Biarritz, combining the best of the beaches with local courses. You can base yourself in Biarritz or make it the first or last stop on a trip that also takes in Bordeaux. Why not get in touch today?